Reinforce important reading strategies with the Close Reading bulletin board display. 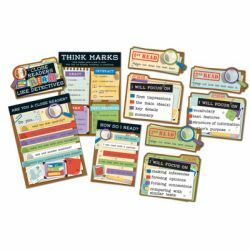 This bulletin board display encourages students to read texts multiple times, to interact with texts using think marks, to examine texts in detail, and to reflect critically. Curriculum-based bulletin boards for classrooms allow you to use valuable wall space for presenting important concepts year-round. These sets visually appeal to students while offering standards-based content and daily reinforcement. Be sure to look for coordinating products to create a cohesive classroom theme.